To understand why I am doing this, please read this post: I Need Your Help. 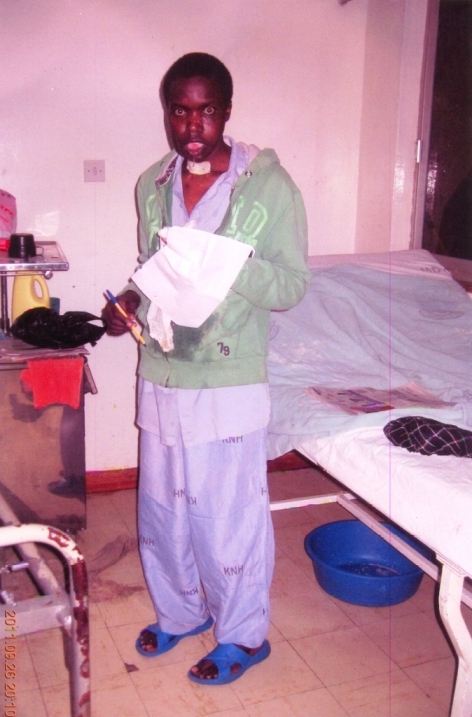 Maoga is a young man from the previous post who had his jaw removed during surgery to remove a lymphatic tumor. After the surgery, I visited him at Kenyatta National Hospital. Today I have spoken with his father. 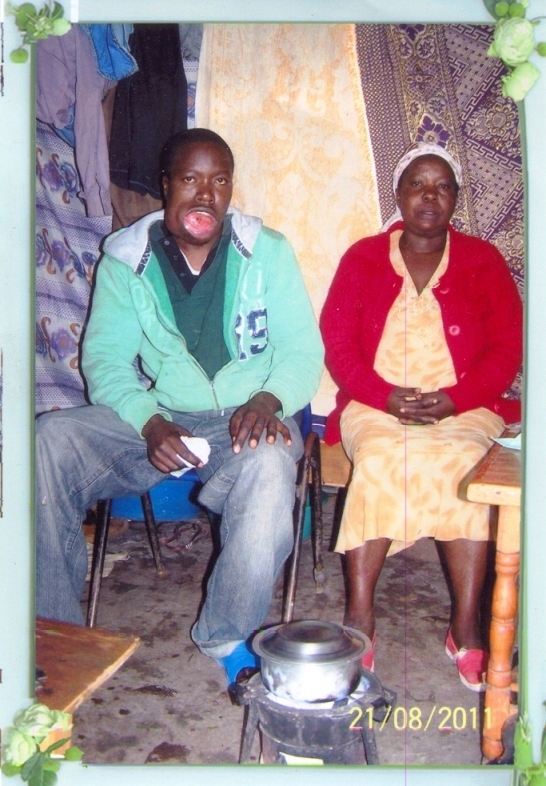 He tells me the surgery to replace his jaw will cost Kshs. 150,000. Yesterday night, the informal settlement he is staying at in Nairobi was demolished by the authorities. Even if I do win the Kshs.50,000 (I’m told votes alone may not be the judging criteria), we’re still short by Kshs.100,000. It is because of this that I have decided to ask for your help: MPESA. Send to the number 0727 832685, it’s my number. I will give you a full report. If 200 people reading this send Kshs 1000, that’s Kshs.200,000. If 1000 people send 200 bob each, that’s still Kshs.200,000. P.S. If you are a blogger, please REBLOG and let’s commence operation Give Maoga a Smile. For other readers: RETWEET, SHARE on your FB walls, send your 2 cents, do something. Over the past couple of weeks or months, morality as a code to live by has been brought to the fore by certain occurrences, acts and events in the country and their subsequent backlash. We had the Gardens, the tapes, the swaggerific (the name itself should tell of its vanity!) and also the recent outcry of the deplorable radio show. [The listing is not in any order]. There were scattered outbursts pertaining to the earlier 3 (& probably others I’ve not mentioned) but as pertaining the radio show this article certainly provoked a lot of outrage that was obviously just bubbling under and, triggered by the article, found an avenue to break free! I wouldn’t use the same language used in the article but I share the disgust of the show’s content & more so that every public vehicle seem to be glued to it every morning almost religiously!! So what many were saying essentially is…..
It’s clear that some degree of morality or at least the appearance of holding morality in high regard is still alive in a time when none of it seems to be of value or talked of as valuable! This gives a glimmer of hope for the future, at least for me! But that is not the point of this article! This article is really pointing at the blatant duplicity in the argument for morality (or lack of it!) When I talk of ‘morality’ I’m addressing those that subscribe to a moral code/law which to the greater extent happens to be those who have strands of faith in a moral law giver i.e. Christians, Muslims, other theists and even the atheists with a weak faith in their beliefs. An atheist should in no way be bothered by any of these issues as to them ‘anything goes’ so long as it’s good for you! A case of “it depends” or subjective versus objective issue, right? So I doubt this concerns them. 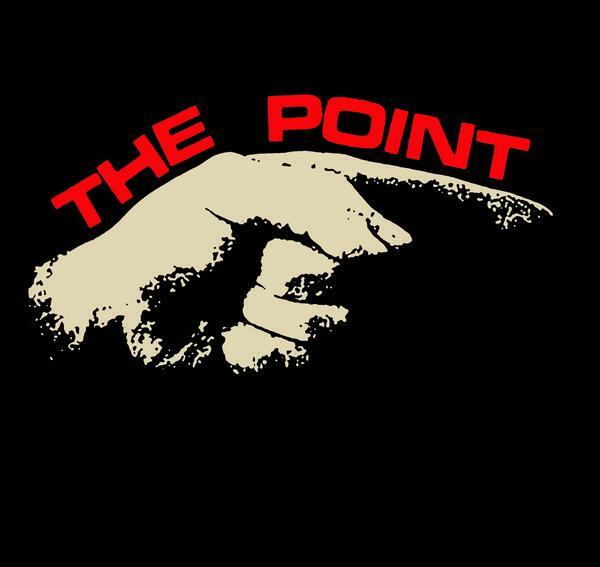 How can you very eloquently voice your disgust of/for the degrading of morals by the radio show then turn and support a blog that talks of prostitution like it is some glorious achievement or calling? What exactly are you saying because it seems what you are disgusted by is the “how” rather than the “what”!! 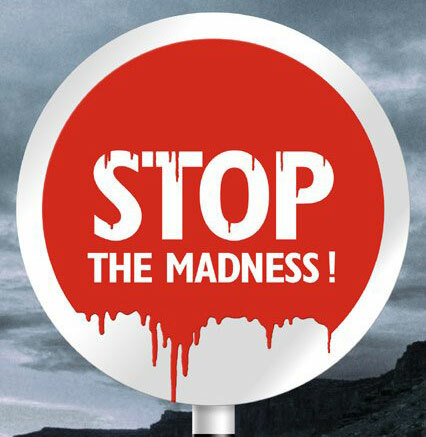 If your problem is the fact that such erosion of value is on radio as opposed to being blogged about, then please STOP! The line of morality is no respecter of art or literature form – it cuts across all that! You either denounce all or none at all! The how, I believe, is not where the “Oscar Wilde line” is to be drawn nor is it where he thought we would interpret his words to mean! But this is an ethical issue? You can’t bring the issue of morality in this! Really? So which side are you on? Ethics devoid of morality or ethics evidenced by morality? We make men without chests and expect from them virtue & enterprise. We laugh at honor and are shocked to find traitors in our midst! Here Mr. Lewis had just made a case that it’s unhealthy to be a man “with a head and a stomach but without a chest” simply put, you can’t be just working with logic (head) and what I’d loosely interpret as ‘greed’ or ‘what’s in it for me’ approach to life (stomach) and without a heart (chest) which if I can employ the Hebrew understanding of ‘heart’ would include emotions & morals! We need more “men with chests” if this is to change! Judging by the growing popularity of the blog, I have two conclusions: either the ‘author’ is a great writer or people are just interested in some guilty pleasure without dirtying their hands! If it’s the former, then she can definitely write on other issues and leave the ‘life choice’ right? If it’s the latter, then we need NOT be surprised if all hell breaks loose on radio, TV, music shows and events now, do we? Safe to say that we are way past just being on TV… We didn’t heed his call then and are clearly not now which means it’s going to get worse, especially with the double standard approach we have to such issues. P. S. (or Disclaimer) This is no way attacking anyone but merely making a point on the basis of principles and thought and maybe to some extent of worldview. I don’t know exactly what this means but my sketchy Luo tells me that “buru” is dust. This is actually the same word used in “Buruburu” estate. Not sure how that came about either. And “tero” (NOTE: it’s not Teroo the presenter with a lovely smile ) means “to take” so I would directly translate this to mean “Take dust” which I would imagine implies something to the tune of “Eat my dust”. But as I said, my Luo is sketchy at best so if you can or know someone who can interpret this, please ask them to! (Agwata is a calabash cut for use as drinking container. motuch-that has a hole. Oknyal-can’t. twomo-serve,carry nyuka-porridge. (Akala-local open shoes/sandals made of used car tyres. motuch-that has a hole. kutho/kudho-thorns. Chwoyi-prick or pierce you. (Long-adaptation from ‘long trouser meaning just that.Moyiech-that is torn. Nyako-lady/girl. Weyi-leave you. (tp-Tissue paper. oknyal-cannot. Yweyo-wipe. Sianda-*behind. If you do not agree with the translation by Alffie, educate everyone with the correct translation in the comments section. If you have a song, skit, chant or anything in any mother tongue, you can send it to the.alt.focus@gmail.com and let us appreciate our culture. Moreover, you can win a price. Alffie starts us off on Keeping it Kenyan with this Luo Cheering Song. The Alternative Focus is all about YOU, yes, YOU who is reading this. This is why we are giving you a chance to be a part of it. If you have anything you would like to share, all you have to do is write an email to the.alt.focus@gmail.com and we will publish it. We are even taking things to a different level. Most literature in Kenyan blogs is in English, a little in French and very little in Swahili. I am yet to see a post entirely in Kikuyu, Luo, Kalenjin, Maasai or any vernacular language. Our ancestors were known to pass valuable lessons to their children in the form of songs, riddles, proverbs, poems, short stories etc. These were letter passed on from generation to generation. However, there is a risk that our generation will not be able to pass these to the next generation. Instead, we will pass foreign literature. Something has to be done about it. I kindly ask you to send any literature available/existing in your (or any) mother tongue (and hopefully with a translation). If you can compose, then that is great, if you do not know your mother tongue, you can get your folks, uncles, aunts or any relative to write you one. The idea is to interact with fun literary works of our various cultures, nothing too serious. If you are wrong on the translations, I am sure someone will be happy to correct you in the comments section and we will all learn something. As if that was not enough, gifts will be given to the best piece every month, how cool is that?